The name comes from: Green Laser from o-like.com. 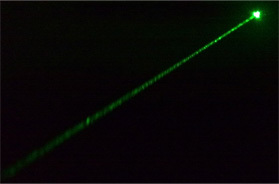 o-like.com is a site selling a variety of lasers, i.e. finished products, and also a variety laser laser modules. 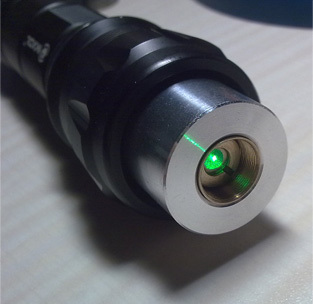 To construct a green laser module from scratch would require a lot of expertise, not to mention professional tools, since it is using Diode Pumped Solid State (DPSS) technology. 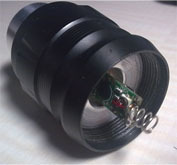 To save the trouble, I decided to order the green laser module instead. One could use it on it's own by just attaching some wires to connect it to a 3V battery pack, but this would be rather clumsy, and so I opt, as most members of the laserpointerforums would, to house it in a torchlight/flashlight. First up, I decided that I'd order the 50mW green laser module from o-like.com, and I chose 50mW because I wanted to have a strong beam that could be seen, but also don't want to spend too much money on my first green laser should I break it or destroy it for some reason (like over voltage, heating issues and ESD if that's even possible in Singapore). It ships in just bubblewrap only so it may be a bit risky, but mine turned out alright. It can be powered from two fully charged NiMH batteries (2.4V in total) but to get decent power, 3.0V is required. Most electronic components can be pushed a bit further than rated as long as heat dissipation is good. I decided that I would get a really nice heatsink for this, so as to push it to 3.6V hopefully to get a little more power! 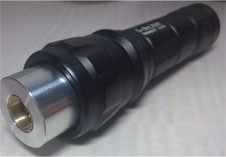 One of the most favourite hosts chosen by pocket laser enthusiasts is a torchlight, since it offers good housing for both the batteries and the laser (which replaces the bulb), and comes with a switch as well. A very neat package that is sturdy if done properly. In Singapore, a shop that specialises in torchlights isn't easy to find if there is one in the first place, so a good alternative is DealExtreme; a Hong Kong based company that ships to everywhere in the world for free regardless of package size. The prices there are pretty competitive too! 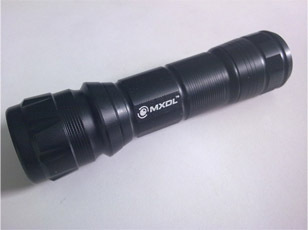 I settled for the MXDL brand of flashlight because it's supposed to have a reputation for being very solidly built since the whole torch body is made from metal. 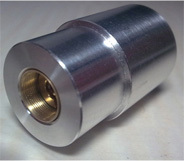 This also allows better heat dissipation from the laser. 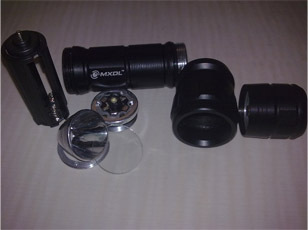 After many days looking around the site and scouting around the forums for previous experiences with the MXDL torches, I finally chose the sku.1442 since it was the cheapest, US$9.90, and was also a back button clicky which meant it would not be very different from the others which were also back clicky. One thing to note about DealExtreme however, is their slow delivery time. Be prepared to wait up to a month for your order to arrive AFTER it processes which takes another week or so depending on their stock. Nevertheless, you save quite a bit of money. A similar torch where I live (especially since it's LED) would cost S$20 and up. After it arrived, I dismantled the torch to see how I could fit in the laser. Not too bad actually, very little modifications were needed to be made. First, the LED and its board had to be removed, since the laser was going to take their place. That leaves the ring that you see on the left. Then just screw the ring back on to the body of the torch so that now there is a larger space from the head of the torch to the battery holder for the laser. The module's pretty long, so this step was absolutely necessary. I sent the dimensions of the heatsink to a friend after measuring the head of the torch with a pair of vernier calipers. He managed to get it under precision machining, which lowered the tolerence to 0.2mm, making it a very smooth and sturdy fit in the torch. I press fitted the laser module in by first putting a bit of tape on to the brass part to make it slightly bigger, then forcing the thing into the heatsink where it stays very tightly. Just slid it into the head of the torch, and it hardly even wobbles! Precision machining ftw. Green lasers tend to have the inputs the other way round, as you can see, the spring is negative, which means that the batteries in the torch has to be pointed negative side toward the head, which is opposite of what most torches would have. So I just turned the battery holder around and slotted it back in to the torch. So this is the completed laser. A bit big for the pocket, but it's mobile enough, and very sturdy. The only gripe I currently have about it is that the contacts aren't very good and so takes quite a bit of shaking and tweaking to get it to full power. I'll try to solve that some other time. A beamshot of this laser at night with a phone camera. No tweaking of exposure, and unedited (save for cropping and resizing). It's brighter than that when u see it though. Cameras somehow don't do justice to beamshots!